Like many leaders, I want to be a great leader and I always strive to be my best. Yet, I wonder is my best good enough? 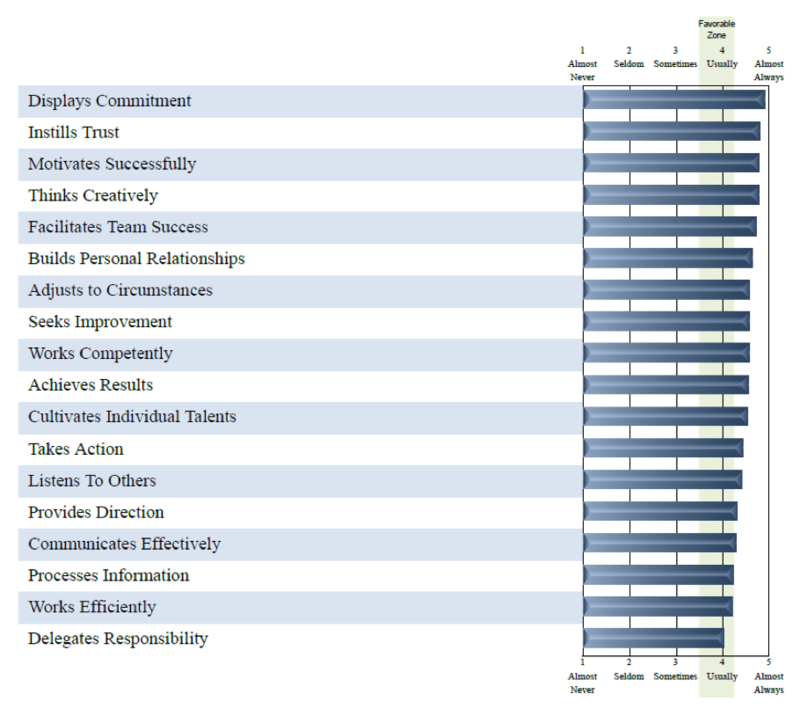 What do others think about my leadership style? During this past year, I chose to be brave and get feedback through the CheckPoint 360° Competency Feedback System™ – Management Report. I’ll admit, I was nervous to initiate this and when the report landed in my inbox, I was even more scared to open and review the report, especially because I expanded the feedback from direct reports, colleagues to several clients. 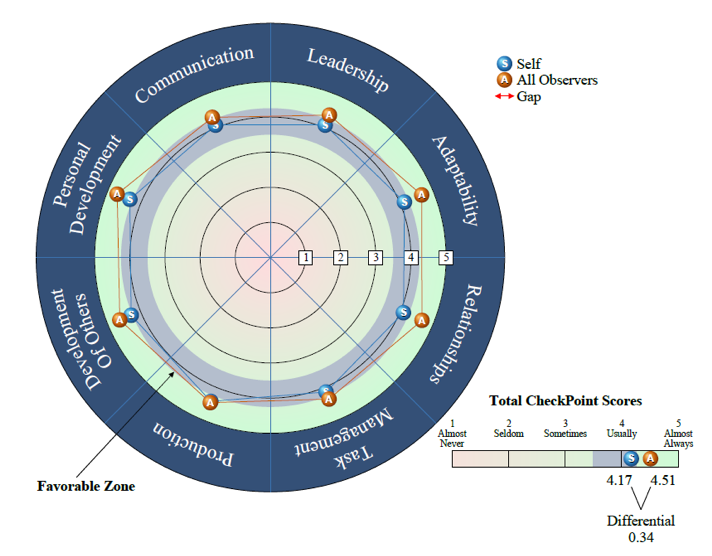 I closed my office door, turned off my emails and took a deep breath as I opened the report and quickly scanned this Executive Competency Overview 360° Wheel with the 8 Core Management Competencies of Adaptability, Development of Others, Relationships, Communication, Task Management, Production, Leadership and Personal Development. It was well worth it, as I learned more about my strengths, a few blind spots and what I need to put into action to become a stronger leader. It only takes 15 minutes for you and your direct reports, colleagues, boss and even your clients to complete a simple series of questions. It’s anonymous, so you don’t know how each person is rating you. Here’s what you’ll receive as part of the extensive and detailed 22-page report. Self-awareness is especially important when it comes to leadership. Even though I knew I needed to do a betterjob of delegating responsibility, this report told me my team was telling me the same thing. I also thought I was working efficiently, yet others viewed my working harder as inefficient. Leading people requires a careful balance of competing priorities and understanding how people see you. Dialogue is the first step in moving from measurement to improvement. This assessment of the 8-18-70 skill sets allows you to have better conversations and dialogues with your team. I openly shared my results with my team and clients and asked for feedback on what I could do to work more efficiently and delegate responsibility better. This assessment helps develop professional and personal goals for the next year. By providing easy, digestible areas to examine, leaders will naturally grasp them in order to continue their improvement. The CheckPoint 360° Assessment clarifies behaviors and holds me more accountable with my team, peers and clients to improve and change behaviours. This assessment is one of the most powerful tools you can have. It will help you quickly improve your performance to become a better leader. Honest and reliable feedback is necessary to test one’s own perceptions, recognize previously unseen strengths, and become aware of blind spots in one’s self-perceptions. I’m grateful to have completed this and challenge other leaders to do the same! Teneo Challenge: Be Brave! As a leader, find out how you can grow your strengths and uncover any blind spots you might have to help you become a stronger leader in the next year. If would like to discuss this further or put it into action, contact us to begin your CheckPoint 360° Assessment at lisa@teneoresults.com or click here for more information.